Today's post is about my favorite painting, Self Portrait with a Harp by Rose Adélaïde Ducreux. Last semester we had an assignment to pick a painting and write about it, so naturally I jumped on the opportunity to find out more about this beautiful work. Over the next few days I'll be posting my research. Here's part 1! Self Portrait with a Harp, by Rose Adélaïde Ducreux, c. 1791. In the collection of The Metropolitan Museum of Art. Self Portrait with a Harp, from circa 1791, is an elegant example of late eighteenth-century portraiture, praised when first displayed for its beauty and realism. At first glance it seems odd that a painting depicting such a luxurious garment would be praised during the French Revolution, a time when the population of France rose up against luxury and absolutism. Yet a closer look reveals ideas closer to the ideology of the French Revolution. Ducreux’s painting represents the transitional time of 1791. 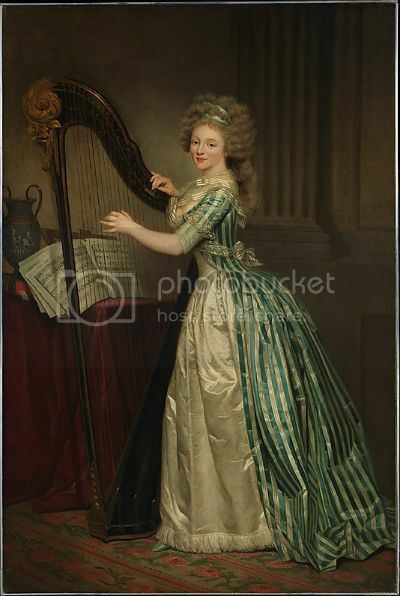 With the luxury of the fabrics contrasting with the simplicity of the neoclassical background, and its reinforcements of femininity, Self Portrait with a Harp seems to embody the dichotomy of the politics of 1791. Rose Adélaïde Ducreux is a relatively unknown artist. She was born on August 19, 1761 to Joseph Ducreux and Philippine-Rose Cosse. Her father Joseph was a painter himself, and had been a portraitist to Marie Antoinette, travelling to Vienne to paint her in 1769. Rose was taught to paint and draw by her father, who gave all of his surviving children an artistic education. Rose Ducreux exhibited her first work at the Salon de Correspondance in 1785, but as she was not a member of the Académie Royale de Peinture et de Sculpture she was not allowed to exhibit her works in the official Paris Salons until their doors were opened to the general public in 1791. Self Portrait with a Harp was exhibited at the Salon in September 1791, receiving a favorable response from critics. Ducreux continued to exhibit at Salons between 1793 and 1799. She left Paris in 1802, travelling to Saint Domingue with her fiancée, Francois Lequoy de Montigiraud, a prefect of the island, and her father. She died of yellow fever in 1802, her father dying of the same disease two days later. At first glance, it seems odd that during the democratizing French Revolution, a painting exhibiting such luxurious fashion would be praised. In her portrait, Ducreux wears a turquoise and white robe a l’anglaise with a zone front, the luster of the fabric suggesting a silk satin. The outer robe is made of a turquoise and white striped fabric, while the zone front and petticoat are a pure white. A translucent silk fichu with satin stripes is wound about her torso, and her sleeves are overlaid with a delicate lace. Fringe decorates the bottom of the petticoat. Luxury is suggested in ever detail. The textile of the outer robe shows highly skilled workmanship, with three smaller, subtle, lustrous stripes residing within each white stripe. The fichu is similarly decorated with satin woven stripes and polka dots.